In 2012 9-year-old Abigail (Abby) Bacho died on Christmas Day after fatal injuries she sustained in a family car accident three days earlier. In the aftermath of Abby’s death her family started a foundation in her memory. Abby's Angels Bracelets, the idea of her cousins, Miranda and Paige Vega, serve to perpetuate the love and happiness Abby shared with others during her short life. That’s the question that Natalie and Stephen Bacho asked themselves when forming the Abby’s Angels Foundation, in memory of their middle child. The foundation’s first fund-raising event—The 5K Rainbow Run and Family Fun Day—will be Saturday, April 19, from 9 a.m.-2 p.m. It offers all of the things Abby would have loved and raises funds for organ donation awareness, support for organ donor families, children who have lost siblings, and defensive driving classes for teens. In addition to a color run, families can enjoy face painting, crazy hair makeovers, frozen drinks, pizza and a magic show. It will be held at the Coweta County Fairgrounds, 275 Pine Road, Newnan. On-site runner registration begins at 7 a.m. To learn more, go to www.abbysangelsfoundation.org. NEWNAN—When she was 9 years old, Abby Bacho loved to play school with her younger sister. High-spirited Abby was usually the teacher and 5-year-old Charlotte her pupil. Abigail Gracen Bacho, the middle of three daughters of Stephen and Natalie Bacho of Newnan, enjoyed singing and had celebrated her first Communion at St. Mary Magdalene Church in 2010. Natalie Bacho says Abby loved getting “fresh” colorful school supplies each year and had expressed interest in becoming a teacher. She loved spending time with cousins and friends, and most of all sharing with others. On Christmas Day 2012, Abby died from injuries sustained in a car accident three days earlier. Her family decided to donate her organs, saving the lives of five people. Natalie and Stephen and all three girls—Hannah, Abby and Charlotte—had piled in the family van on a Saturday. They went skating, and to Mass and a meal out. They were on the way to see Christmas lights when a teenage driver ran a red light, hitting their van. Stephen and Abby were both transported by helicopter to Atlanta hospitals. Stephen was in a medically induced coma for four weeks, only learning of his daughter’s death afterward. “Our grief started in two completely different places. We’re bringing it together every day,” said Natalie. Now, the Bachos are taking all of Abby’s vibrant and generous qualities, pouring them into a foundation serving others. They are drawing strength from their Catholic faith and the support and prayers of others. On Saturday, April 19, the Abby’s Angels Foundation will hold its first 5K Rainbow Run and Family Day at the Coweta County Fairgrounds in Newnan. “April is Organ Donor Awareness Month,” said Natalie. April 19 is also the day before Easter. “It made it even more perfect,” said Natalie about the event date. The Bachos hope to bring organ donation into the light and “spark a little bit of conversation about it,” said Natalie. “The awareness isn’t quite there yet,” said Stephen. Natalie is a surgical nurse, and her brother-in-law is a transplant surgeon at Emory University Hospital. “We were very aware of the importance of the decision,” said Natalie. She added they never thought in “a million years” that they would have to face the issue personally. “We knew Abby’s heart,” said Natalie about the choice to give her organs to others. “Why?” is the question Natalie recalls asking about it happening on Christmas. Her sister told her, “God gave us Jesus as his gift to us” and that Abby could now save others. Stephen said that he doesn’t want to know the identities of those whose lives were saved from the transplants; just that they are happy and healthy. “That’s all I need,” he said. According to the United Network for Organ Sharing, there are more than 121,825 patients currently on the waiting list for organ transplants in the United States. There are 4,264 Georgians awaiting organ donations. Despite the compassion of transplant coordinators and medical staff, Natalie said the process is overwhelming once the decision is reached. “It is very lonely,” she said. “All the excitement is on the other side,” said Stephen. One of the goals of their newly created foundation will be to offer care to families of organ donors. Stephen suggested support could include a care package with a note from a family who has been in the same situation. The upcoming run will help raise funds for resources for organ donor families and to form support networks for children who have experienced the death of a sibling. “We’ve noticed how differently children process it,” said Natalie about grief. 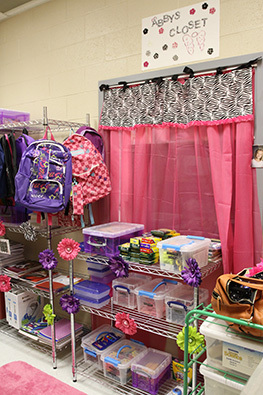 The family has also started school supply rooms or areas called “Abby’s Closets” at four Coweta County public schools and two schools in West Virginia. Both Natalie and Stephen are West Virginia natives. The closets are stocked with binders, notebooks, stylish locker accessories, backpacks—anything a child might need for school but cannot afford. The children can come and discreetly pick out needed items so they can feel special too. The school counselors can also give these children rewards from the closet for good grades or behavior. During the Rainbow Run, colored powder will be tossed on runners at various stations. Natalie said Abby had learned about a color run from one of her teachers. “It screams her,” said Natalie about the event’s flavor. While runners pay a registration fee, the family fun activities such as face painting, crazy hair stations, and a magic show, are free and open to the public. Family is the whole mood of the day, emphasize the Bachos. Donate Life will also be on site to sign up organ donors and to raise awareness about organ sharing. In addition to the funds raised through the event, the foundation also offers beaded bracelets with a cross. Abby’s cousins, Paige, Miranda and Rachael Vega, began making the bracelets during Stephen’s hospitalization. Natalie and her surviving daughters were staying with the Vegas in Atlanta to be closer to Stephen. Paige and Miranda both attend St. Pius X High School, Atlanta, and Rachael is a junior at Auburn University. What started as Paige’s idea to comfort the family, turned into more. The Bachos gave a bracelet to the teen driver convicted in the accident, Taylor Long. Now 19, Long is serving a 12-month sentence for misdemeanor vehicular manslaughter. Part of the sentence includes work release jail time, probation and cooperation in a public service announcement about distracted driving. He was not under the influence, or texting, but was likely talking on his cell phone prior to running the red light. Natalie said they have heard that he wears his Abby’s bracelet daily. “I hope he can use this,” she said. In the recorded public service announcement, Long reminds motorists to think twice. Stephen Bacho said he has been told by drivers that they have reached for their cell phone, but stopped simply because they were wearing one of the bracelets. According to the National Highway Traffic Safety Administration, 3,328 people were killed in distracted driving accidents in 2012. Another plan of the Bachos is to bring the program “Fear This 4 Life,” a defensive driving class for teens, to Newnan. “We’re working on getting that here as a summer course,” said Natalie. The nonprofit program teaches safe driving and car care. In addition to family, friends from St. Mary Magdalene also make Abby’s bracelets and are helping to plan the run and family fun day. “It’s definitely a labor of love,” said Natalie. She added that fellow parishioners did much for them following the accident such as yard work and taking down Christmas decorations. “Father Dan was unbelievable,” said Natalie about then-pastor Father Dan Fleming’s care. The Bachos say they have taken comfort in the prayers of others and their faith. The family had been to Mass, receiving the Eucharist, the evening of the accident. “We’re so glad that we did,” said Natalie. Natalie recalls that young Charlotte was in need of a tonsillectomy at that time. She fell asleep on her mom’s shoulder at church, and to the amusement of a giggling Abby, began to snore like an old man because of her tonsils. “Our faith tells us that we’ll see her again,” said Stephen. It is difficult for Natalie and Stephen to talk about the circumstances of their Abby’s death, but a blessing to share her nature and spirit with others. “It’s a gift,” said Natalie.